Email from the College of DuPage received 4/16/2019 . . .
Greetings from College of DuPage! Thank you for your interest in the GADgET Girls summer camp! The camp schedule has been finalized, and registration is now open! This one-week camp is designed to introduce girls, ages 11 to 14, to design and manufacturing processes, brought to you by the Youth Academy and Manufacturing Technology department. This camp will encourage creativity, self-confidence and innovation by introducing students to design and manufacturing processes and equipment. Students will be able to complete their own projects through guided instruction and will have the opportunity to explore career paths in manufacturing and engage with women currently working in the field. Students should bring a sack lunch each day. There will be at least one field trip to a local manufacturing facility during the camp. There is a limited capacity for this camp due to the number of workstations available in the manufacturing lab. We highly recommend registering as early as possible to ensure a spot is available for your child. You may register online at myaccess.cod.edu or over the phone with our registration staff at (630) 942-2208. When registering online, click on “Continuing Education Classes” on the right side of the screen, then choose “Youth Classes (Grades K-8)” on the right side. Once capacity has been met, a waitlist will be started. To be added to the waitlist, please call our registration staff at the number listed above. In conjunction with their exhibition Caravans of Gold, Fragments in Time, The Block is excited to announce a week of conversations, workshops, and symposia featuring a panel of international archaeologists. These public events, ranging from scholarly conversations to a keynote lecture delivered by noted archaeologist Susan Keech McIntosh, offer rare opportunities to interact with these scholars and learn more about their research. All events are free and open to all. Click here for view all events. The following is a blog post from professional member Midwest Academy for Gifted Education. You can see this post and others on the MAGE website. Chicago Public Schools, CPS, in a meeting on August 22, chose to defer the adoption of this act, and the deferral decision can be read here. Only 3 people came to speak for the immediate adoption of the Accelerated Placement Act in CPS in that August 22nd meeting, which was well covered by Chalkbeat, and you can read about it here. After 3/4 of a year with news from CPS, these new forums are finally scheduled. They come at an auspicious time - CPS Selective Enrollment School results come out for Kindergarten through eighth grade on the 22nd of April, the day before the meeting. Therefore, it is unclear if there will be change, what year the change will take effect, and how it will impact the decisions made for the coming year. It is important to show CPS that you care about gifted education in the city, and that you show up. Unless people step up and show up, CPS will continue to defer the adoption of this act. You can read our coverage of the Accelerated Placement Act Part 1 here. Not in Chicago? Your district is watching. The state is watching. The country is watching. 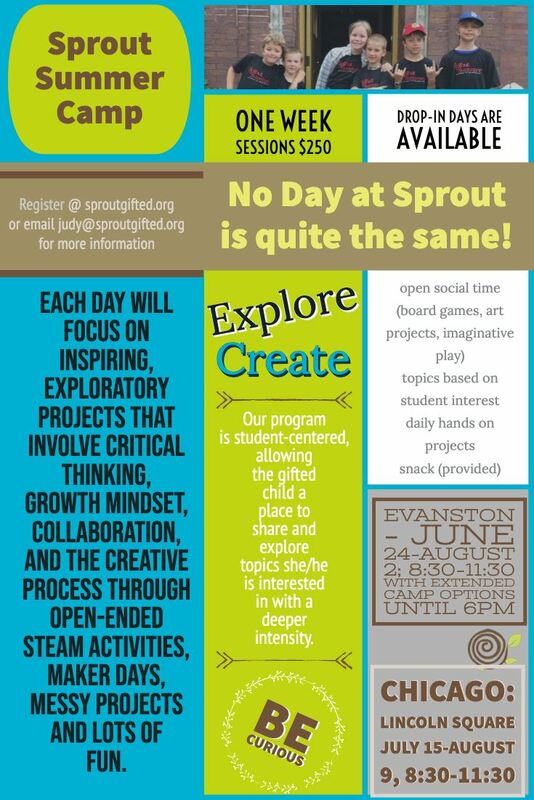 If you care about gifted education, you should come and participate in those forums because your support is paramount in improving the gifted education in Chicago and everywhere that will use it as a case example. Sprout is a professional member of CGCC. From the AudioFile Magazine April newsletter . . .
SYNC Audiobooks for Teens 2019 will give away 28 titles—two paired audiobook downloads a week—April 25th through August 1st. Authors include Jennifer A. Nielsen, Emma Donoghue, Kareem Abdul-Jabbar and Tanaz Bhathena. Check out the complete list of exciting audiobook titles. How can you promote SYNC? Utilize the print and digital items available in the SYNC Toolkitto introduce SYNC to your patrons, students, and other readers. Visit www.audiobooksync.com and sign up for title alerts by email. For questions about the program, titles, and how to use the toolkit to connect with students, patrons, and other listeners, please contact the SYNC Manager, Michele Cobb, at sync@audiofilemagazine.com. Apply for the 2019 program now through April 12! Teens are invited to share their ideas on how MSI can better engage youth audiences in this new initiative. MSI provides experiences that deepen the engagement and interaction of youth, and people of all ages, in science and science-related disciplines, with a vision to inspire and motivate in the fields of science, technology, engineering and medicine. Our Teen Advisory Committee (TAC) is seeking youth ages 14–17 who love science, especially MSI. We want to hear your ideas on “Hacking the Museum” and feedback on a range of Museum content. Teen Advisory Committee members are required to attend four meetings, complete short, online tasks before each meeting, and provide feedback on a variety of content topics. Members should be comfortable speaking in front of a group of their peers and senior Museum management. Also, participating in TAC will look great on resumes and college applications! Complete the application and answer a few questions that will help us get to know you better. All applications must be submitted by April 12, 2019 to be considered for the committee. For questions regarding the Museum of Science and Industry’s Teen Advisory Committee, please email MSITNAC@msichicago.org. Every Saturday in April, Sulzer Regional Library's home-grown poet, Eleanore Tisch, will lead their Pop-Up Poetry Club, culminating in an open mic during their Poetry Fest on April 27. Pop-Up Poetry Club (Grades 6-12) Saturdays, Apr. 6–27, 11 am–noon, In this four-week long workshop, young poets will be invited to generate new material, discuss the work of a wide array of classic and modern poets, and learn re-visioning techniques for their own writing. All levels and experiences are welcome - come exactly as you are and be a ready to dive deeply into the luminous world of poetic language! From the Chicago Film Festival email . . . The CineYouth Film Pitch is a one-day program that allows select participants to present their works-in-progress to a panel of industry professionals for a chance to get direct feedback from the experts who know the film business best. One lucky pitch participant will win a cash prize to support their project! The Film Pitch will take place Sunday, April 28 during the CineYouth Festival in the Music Box Theatre Lounge from 10:00am-2:00pm. Applications are now open. Applicants must be between 16 and 22 years old to participate. Submit your project by April 1 to be considered for The Pitch. Created in 2005, CineYouth is the Chicago International Film Festival’s annual three-day showcase of short films made by filmmakers 22-years-old and younger from around the world! CineYouth 2019 goes down April 26-28 at Chicago's historic Music Box Theatre. Stay tuned for full schedule and free tickets in early April. Follow @CineYouth on Twitter to stay up to date. Meet the author and illustrator before the book is published! This is a Middle Grade novel. To attend this free event, you must be a student or educator in grades 3-6 (no parents please) and read the ARC ahead of time. To reserve your spot, please email angie.gaul@andersonsbookshop.net to make arrangements to pick up your advanced reading copy of The Star Shepherd at the Naperville, Downers Grove, or LaGrange store, or the Aurora warehouse. Please include your name, phone number, grade & school, whether you're a student or an educator, and where you’d like to pick up your Advanced Reading Copy. Dinner is served, but space is limited.